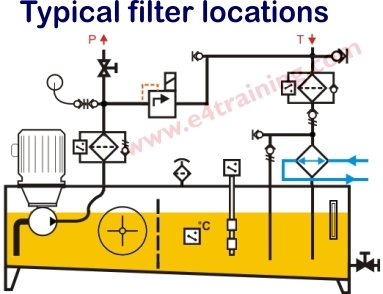 Filters are also known as pressure filters, return line filters, screw-on filters, offline filters, suction filters or air breathers. Over 80% of hydraulic failures are caused by fluid contamination and hydraulic filters are the main line of defence in keeping systems clean. It is vital that filters are sufficiently sized and maintained in order to prevent systems from getting dirty and their reliability suffering as a result. 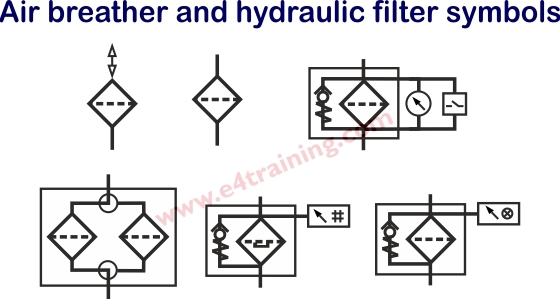 There are a number of different types of filter each designed to be used in a different location within the circuit. Suction filters are used to prevent larger particles of dirt entering, and potentially damaging the pump. They can also improve the flow of the fluid as it passes into the pump, which helps to reduce negative suction heads. Pressure filters clean the fluid after the pump and before it enters the circuit. Some pumps are potential dirt generators, so pressure filters provide an effective safety measure. Return line filters are located just before the fluid returns into the reservoir. They should catch all of the dirt entering the system from the pump and actuators. Because they are low pressure they can provide a more cost-effective way of achieving fine filtration with good dirt retention capacity. Offline filters have a separate pump system to take fluid from the reservoir, pass it through a filter, before returning it to the reservoir again. This allows the fluid to be cleaned even if the machine is not active and often has high flow rates that ensure maximum cleanliness for minimum equipment failures. Air breathers are also a vital part of the complete filtration system. When each cylinder extends it will draw air into the reservoir via the air breather. If this does not include a sufficiently fine filter then the dirty air will enter the reservoir and quickly contaminate the fluid. 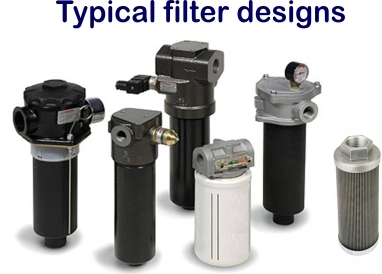 Modern filter element design has been the result of extensive research and technology. The drive has not only been to remove all contaminants as efficiently as possible but also to ensure the element retains as much dirt as possible, without clogging or losing efficiency. Filter performance is commonly quote by its absolute rating e.g. 3, 5, or 10micron. This refers to the maximum size of particle that will pass through it, however, there is no standard test for this size and it does not quantify its effectiveness. The best measure of a filter's performance is its beta rating. Particle counters are used to count the number of each sized particles the filter removes from the fluid, in a standardised multipass test (ISO 16889:1999). We cover this in greater detail in the pro section of this site but a 5micron filter should be specified to Beta(5)=200 for effective performance. Individual filter elements have been developed for use with different fluids and based on how environmentally friendly they are to dispose of. As well as the uses, listed above, there are a great many different installation types and instrumentation fittings. Pressure filters are line or manifold mounted and come with bypass valves or elements that can take full pressure across them without failing. These non-bypass elements are commonly used in servo systems where the valves are more expensive and would fail if the contamination reached them. Return line filters can be line mounted or fitted into the top of a reservoir. In mobile applications, these tend to be spin on canisters. Air breathers can sometimes be sold as simple strainers inside a filler cap although a proper spin on or flange mounted elements are available if properly specified. Bypass check valves to prevent element failure when clogged. Pressure or pressure differential condition monitoring indicators as visual or electrical signals. These may also record the continuous level or just the peak value seen. Top entry elements to reduce leakage and make access easier. Magnets to collect ferrous particles. Manufacturers often patent filter element assembly system to ensure others can't make interchangeable elements that may not achieve the same performance.